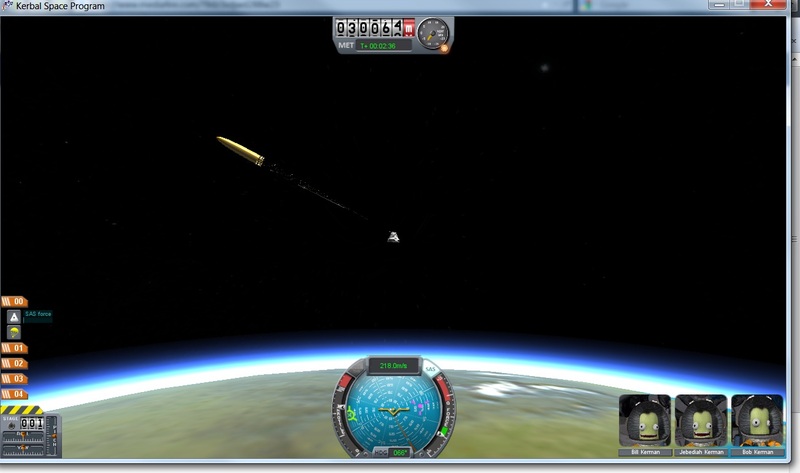 Lately, I’ve been playing around with Kerbal Space Program, an indie game where you design rockets with several components (command module, parachute, solid- & liquid-fuel engines, etc) and then fly them into space. The picture you see above was taken at the apogee of my most successful flight to date — the last motor didn’t sputter out of fuel until the rocket was 30,000 metres off the ground, and the Kerbals made it back to earth safely again! Needless to say, being able to laugh at your own screwups is a vital part of enjoying the game. Currently it’s more of a toy than a game, but it’s an entertaining (and at least slightly educational) one for all that. If you’re interested in real-world space travel, and especially if you remember an old game called Buzz Aldrin’s Race into Space, this is worth a look.